"Blue Suede Shoes" was performed only once in 2009, featuring onstage area Elvis-impersonator Nick Ferraro, white suit and all. 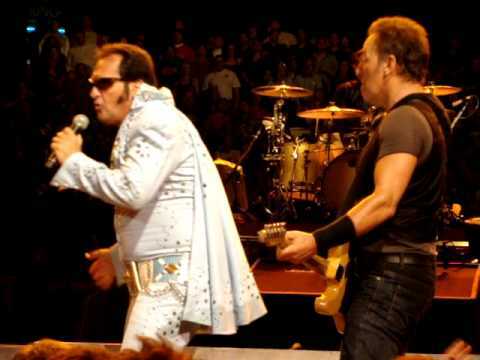 Nick Ferraro also appears in the movie "Springsteen and I"
"Blue Suede Shoes" is a song written and first recorded by Carl Perkins in 1955. It is considered one of the first rockabilly (rock-and-roll) records, incorporating elements of blues, country and pop music of the time. Elvis Presley performed his version of the song three different times on national television. 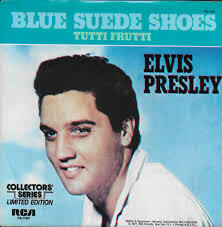 Recording cover versions of songs was a common practice during the 1940s and 1950s, and "Blue Suede Shoes" was one of the first songs RCA Victor wanted its newly contracted artist, Elvis Presley, to record. RCA Victor, with its superior distribution and radio contacts, knew it could probably steal a hit record from Phillips and Perkins. Presley, who knew both Perkins and Phillips from his days at Sun Records, gave in to pressure from RCA, but he requested that the company hold back his version from release as a single. According to Moore, when the song was recorded, "We just went in there and started playing, just winged it. Just followed however Elvis felt." According to reports confirmed by Sam Phillips, RCA Victor producer Steve Sholes agreed not to release Presley's version of the song as a single while Perkins' release was hot. Moore has said that Presley recorded the song to help out Perkins after his accident. "Elvis wasn't really thinking at that time that it was going to make money for Carl; he was doing it as more of a tribute type thing. Of course Carl was glad he did. It really helped as his record started going down. "Blue Suede Shoes" was the first song on the groundbreaking album Elvis Presley. In 1960, Presley re-recorded "Blue Suede Shoes" for the soundtrack of the film G.I. Blues.